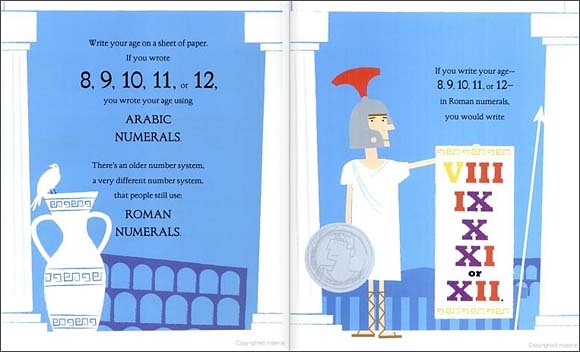 This book uses bold cartoons set in ancient Rome to create a fun introduction to Roman numerals. 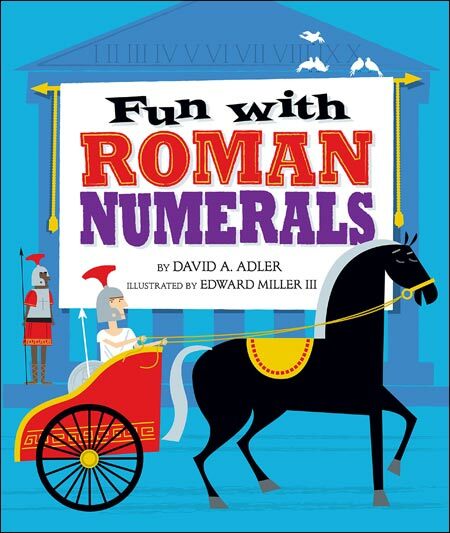 Adler covers how Roman numerals are used in modern society (watch faces, sporting events, book chapters...) and clear explanations on how they are written and counted (incl hands on activities.) Kirkus Reviews ended their review of this book by saying "This team once again hits a home run." However, this is probably not a book that you should sit down and read straight through to your students. 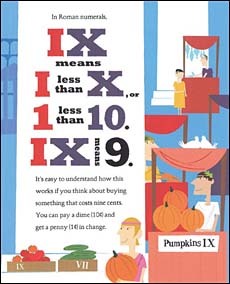 Roman numerals can get quite complex and if taken in one sitting, this book would probably be information overload. We recommend you break it up into several lessons and pair it with short, hands-on exercises. The author provides a very effective activity using different coins. Plus many other spreads in the book would be good lead-ins to related hands-on activities and exercises. 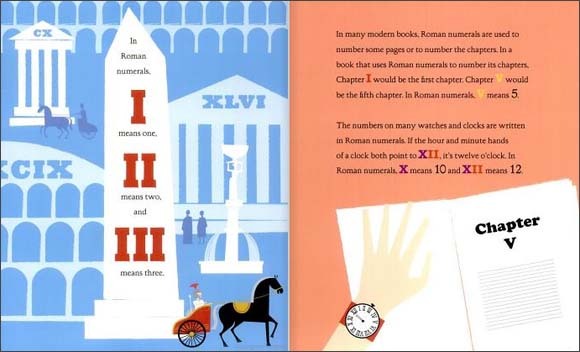 Here are some pages from inside of this book -- to give you an idea of the delightful Roman-style illustrations and the text about Roman Numerals. Additionally, many spreads are interactive like this first one, which invites the reader to write their age, then talks about Arabic verses Roman numerals. Holiday House, the publisher of this title, has created a two page handout of suggested classroom activities to accompany this fun and educational book. The age level of the activities ranges from Grades 1-5. In addition to five related math activities, the handout also includes art activities, language arts activities, plus for suggestions for online activities and other children's math picture books. To access this handout, visit this page on the Holiday House website and click the link at the bottom under "Activity Sheets."